The CHIP, with a banana. It's a boom time for miniature electronics and amateur hacking - the Raspberry Pi devices and Arduino boards are proof of that - but there's a new tiny computer in town that's looking to dramatically undercut the competition. CHIP (it stands for something, but we're not sure what) is a new device from Next Thing Co, and they're looking for Kickstarter funding to help get it off the ground. The basic component can be yours for just US$9 (about £5.80 or AU$11.30). Hook up a keyboard and display and you can use CHIP to play basic games, browse the web or run LibreOffice. It comes with the free Scratch programming language so you can code your own projects. It's already a runaway hit - having raked in around seven times its $50,000 goal at the time of writing - and according to Makerzine the team behind it can get to such a low price thanks to friendly relations with Chinese suppliers. CHIP includes a 1GHz processor, 512MB of RAM and 4GB of storage, as well as Wi-Fi and Bluetooth connectivity options. A PocketCHIP variation is also available complete with a small screen and battery. 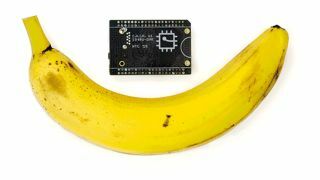 This is a Kickstarter project, so the usual caveats about production and costs apply, but CHIP looks to have the necessary credentials in terms of team expertise and backing. If all goes to plan then units are set to be shipped out in December.